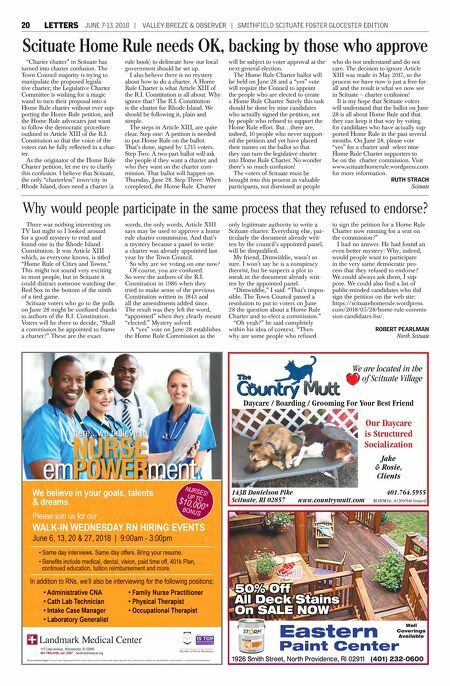 SMITHFIELD SCITUATE FOSTER GLOCESTER EDITION | VALLEY BREEZE & OBSERVER | JUNE 7-13, 2018 IN OUR SCHOOLS 21 Scituate road closure Friday to accommodate graduation ceremony SCITUATE – The town of Scituate has announced that a portion of West Greenville Road, (Route 116), will be closed on Friday, June 8, from 5:30 to 9 p.m., to accommodate for the Scituate High School graduation cere- mony, if weather conditions allow for the exercises to be held outdoors. The road will be closed from the intersection of Danielson Pike to the intersection of Hartford Pike, (Route 6). SHS presents Cabaret Friday SMITHFIELD – The Smithfield High School Music Department will present a Cabaret on Friday, June 8, with two shows – 6 p.m. and 8:30 p.m. – in the SHS Band Room, 90 Pleasant View Ave. The event is listed as "an evening of entertainment and refreshments in an intimate setting." Students will perform song and dance numbers from Broadway pro- ductions. Tickets are $10 for adults and $7 for students and senior citizens. Tickets can be purchased at the door or by emailing kayoung@smith- field-ps.org. CFHS Class of 1958 plans 60-year reunion CENTRAL FALLS – The Central Falls High School Class of 1958 will be holding its 60-year reunion at the Pawtucket Country Club on Friday, Sept. 21. For more information, contact Armand Frechette at 508-222-8059 or Bob Mardo at 401-333-5227. The committee is seeking informa- tion on the following class members: Maurice Azulay, Antonio Carvalho, Richard Johnson, Clair Derois, Christine Moosett, Barbara Lizotte and Jeanne Gula. SCHOOL NEWS REUNION NEWS Call Laura at 334-9555, ext. 145 or e-mail it to laura@valleybreeze.com got a news tip? BREEZE PHOTOS BY CHARLES LAWRENCE Students at Gallagher Middle School, including 7th- grader EMMA FERRARO, right, displayed their creativity at the school's Art Show on May 24. Emma has cre- ated a "Peanut Butter and Jelly Sandwich Face," which she said she did "just to be different." SHANA GARE, of Smithfield, is shown the etching created by student AIDEN POWER. The process involves removing a black coating from metal, revealing the metal underneath to create images that shine and reflect the light in many directions. A hyena, by PAYDAN MCLAUGHLIN, a 7th-grade student, for the Gallagher Middle School Art Show. ROURINA BASTAJIAN and her 7th- grade daugh- ter, SELA, look at some of the many colorful masks created by the students at Gallagher for the Art Show. 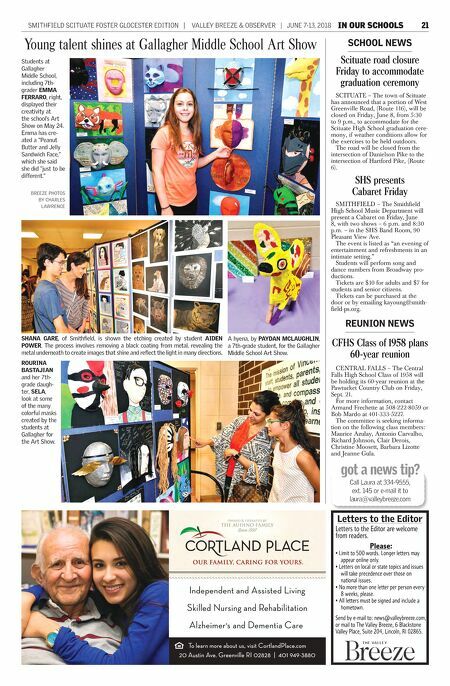 Young talent shines at Gallagher Middle School Art Show Letters to the Editor Letters to the Editor are welcome from readers. Please: • Limit to 500 words. Longer letters may appear online only. • Letters on local or state topics and issues will take precedence over those on national issues. • No more than one letter per person every 8 weeks, please. • All letters must be signed and include a hometown. Send by e-mail to: news@valleybreeze.com, or mail to The Valley Breeze, 6 Blackstone Valley Place, Suite 204, Lincoln, RI 02865.